Autoscaling: Application Gateway or WAF deployments under the autoscaling SKU can scale up or down based on changing traffic load patterns. Autoscaling also removes the requirement to choose a deployment size or instance count during provisioning. This SKU offers true elasticity. In the new SKU, Application Gateway can operate both in fixed capacity (autoscaling disabled) and in autoscaling enabled mode. Fixed capacity mode is useful for scenarios with consistent and predictable workloads. Autoscaling mode is beneficial in applications that see lots of variances in the application traffic. Zone redundancy: An Application Gateway or WAF deployment can span multiple Availability Zones, removing the need to provision and spin separate Application Gateway instances in each zone with a Traffic Manager. You can choose a single zone or multiple zones where Application Gateway instances are deployed, thus ensuring zone failure resiliency. The backend pool for applications can be similarly distributed across availability zones. Performance enhancements: The autoscaling SKU offers up to 5X better SSL offload performance as compared to the generally available SKU. Faster deployment and update time The autoscaling SKU provides faster deployment and update time as compared to the generally available SKU. 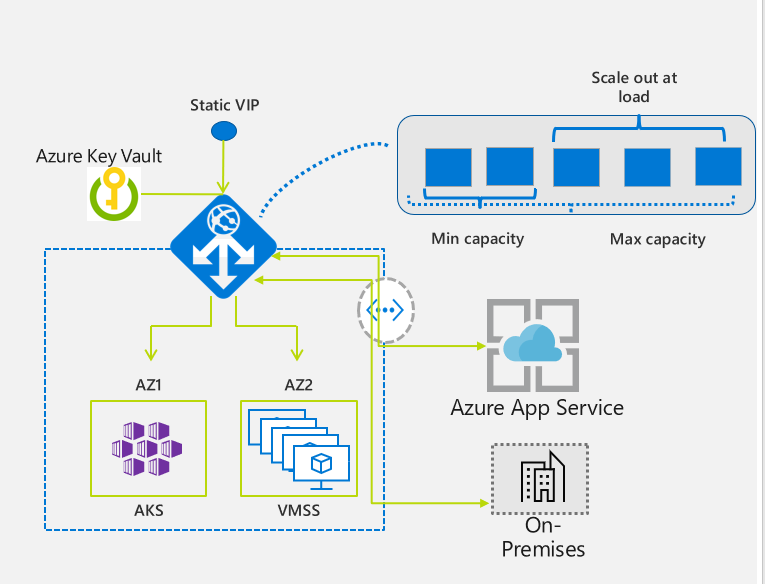 Static VIP: The application gateway VIP now supports the static VIP type exclusively. This ensures that the VIP associated with application gateway doesn't change even after a restart. The autoscaling and zone-redundant application gateway SKU now supports default health probe to automatically monitor the health of all resources in its back-end pool and highlight those backend members that are considered unhealthy. The default health probe wil be automatically configured for all those backends for which you haven't set up any custom probe configuration. To learn more, see health probes in application gateway. The following table compares the features available with each SKU. The autoscaling SKU is available in the following regions: North Central US, South Central US, West US, West US 2, East US, East US 2, Central US, North Europe, West Europe, Southeast Asia, France Central, UK West, Japan East, Japan West. During preview, there's no charge. You are billed for resources other than application gateway, such as Key Vault, virtual machines, and so on. For more information, see Overview of end to end SSL with Application Gateway. - 65503 to 65534 for Standard SKU. Performance logs in Azure diagnostics Not supported. Azure metrics should be used. Billing There is no billing currently. FIPS mode These are currently not supported. ILB only mode This is currently not supported. Public and ILB mode together is supported. Netwatcher integration Not supported in the Public Preview. Learn more about Application Gateway.